You might be aware that we also have an online employee time clock system called (rather imaginatively) Online Time Clock MTS. We’re just entering the last stages of testing for a major update to that system that includes Geolocation (or GPS tracking) and Geofencing. 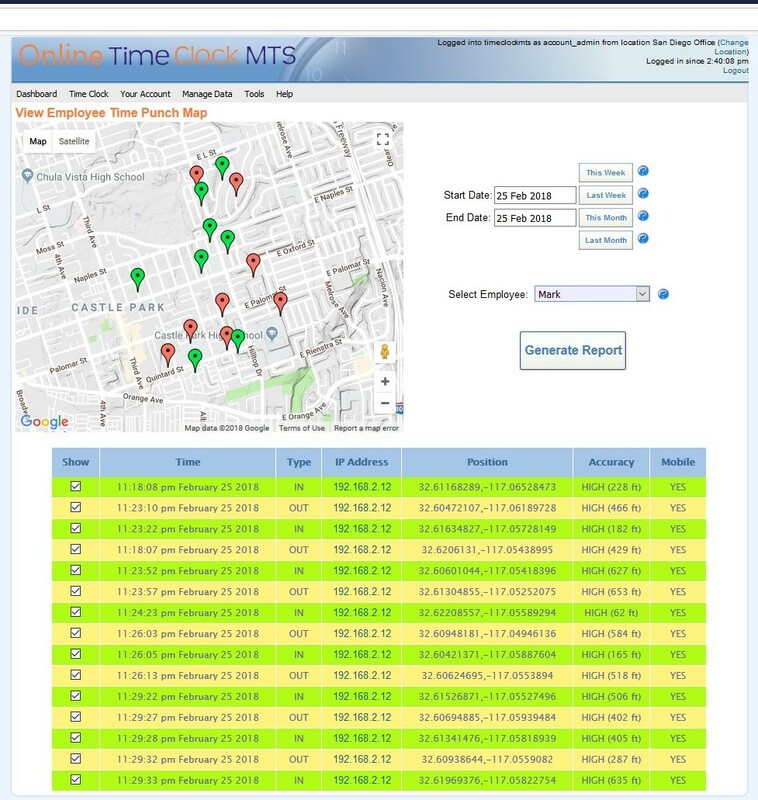 Online Time Clock MTS can record the GPS location of employees when they punch in or out. The position is obtained from the device GPS (if you’re using a mobile device) which is very accurate. 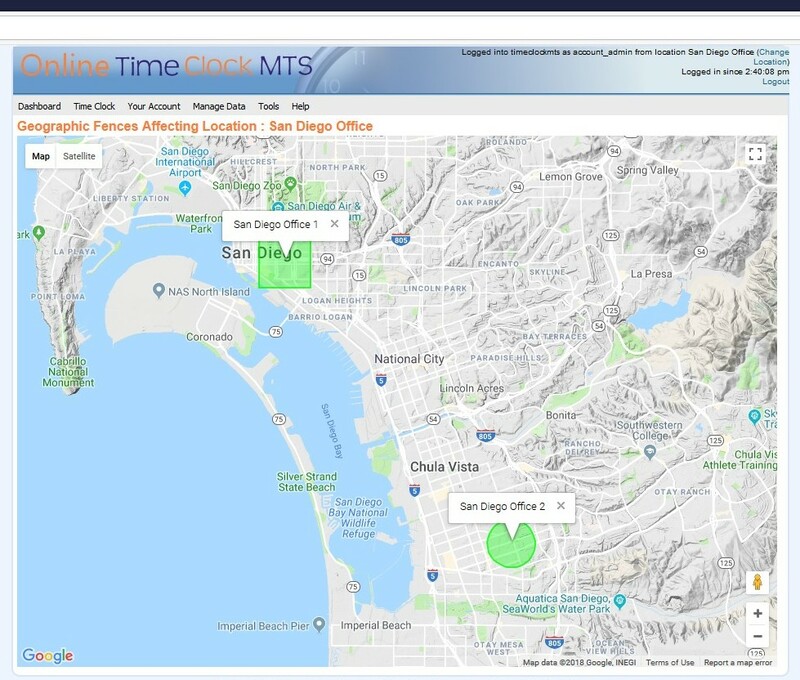 If you’re using a device that doesn’t have a GPS then Online Time Clock MTS will use Geolocation to attempt to determine the employee’s position, this is less accurate but can still be useful. 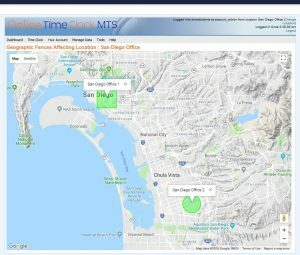 Time clock administrators can view the coordinates of employee time punches on an interactive map display shown below. Punches can be clicked on to view the details of that punch and punches recorded in very similar (or the same) location are ‘spiderfied’ into a graphical web arrangement to allow for easy analysis of stacked time punches. A powerful new feature is Geofencing. Basically this means administrators can define geographic regions by drawing shapes on a map and restrict employees to punching in and out when they are physically within those regions. 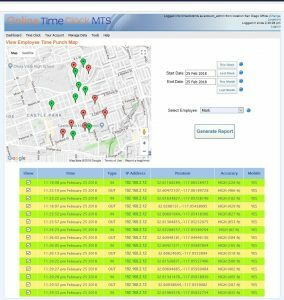 One or more Geofences can be applied to time clock logins and employees will not be able to punch in or out when their location is outside of the fences. Obviously this is going to be a lot more useful when your employees are using the mobile time clock interface on their cell phone or tablet. 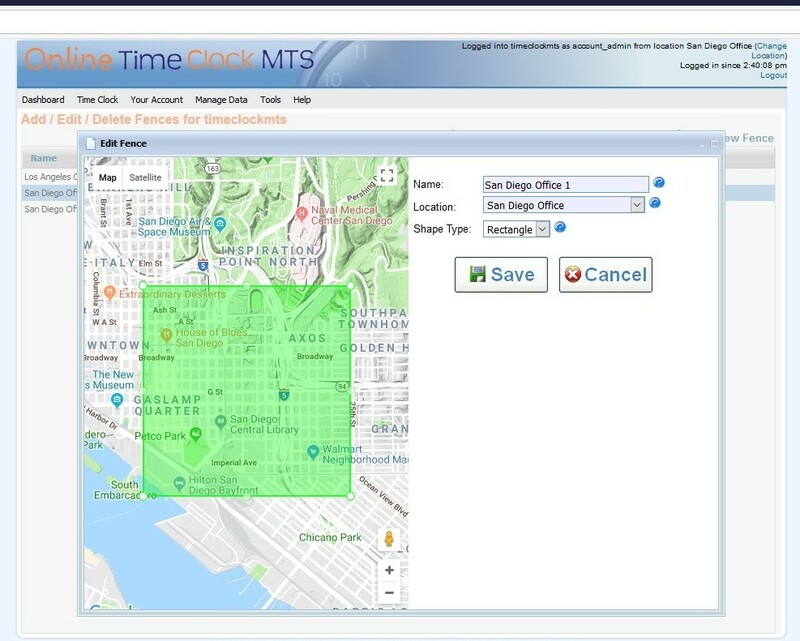 Below you can see a couple of screenshots showing how a geofence is defined and a map view showing the fences that apply to a given time clock location. If this sort of control over where your employees can punch in or out is of importance to you then please consider using Online Time Clock MTS. Right now it’ll cost you nothing for 13 months to do so, users of the desktop version of Time Clock MTS can get a one month trial and then a free 12 month subscription to our web based time clock system. Just head over and setup a 30 day trial and at the end of your trial send us an email and we’ll setup the additional 12 month subscription for you. Deleted employees are no longer checked when updating the status of employees on the employee list. Employee count is now gathered during the main employee status query rather than separately when updating the employee list status. The query that gets the status of a single employee now works correctly if there is more than one time note assigned to the most recent time punch. The grouped employee status query now groups time notes by time rather than returning all notes. Fixed a long standing problem with the selected employee not updating correctly on the employee list when department folders were displayed. Tie breaker sort criteria added to the grouped employee status query to stop it returning more than one record from a sub query. Of course, there should NEVER be two most recent time punches but in the case of database corruption it can happen. This tie breaker criteria will stop an ugly error being thrown. Code for filling the employee list has been greatly improved. Key changes are selection of employee status information via a single query and removal of queries that were selecting non vital data. Just two queries are used to generate the Employee Status Report, formerly a query per employee was required. Checking of compliance with license conditions has been greatly streamlined by combination of database queries into one grouped query. Checking for a live connection to the time clock data file is now only carried out every 10 seconds rather than with each and every new attempt to pull data from the data file. Removed a pointless check for duplicate time punch check when punching in or out. 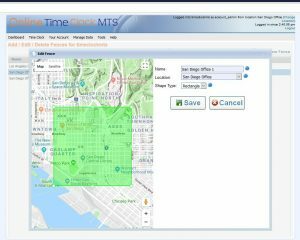 All parameterized queries have been removed when using a MySQL back-end with the Network PLUS Edition of Time Clock MTS. The View Release Notes button on the Check for Updates screen now displays the Release Notes page from the timeclockmts.com website. The warning about the Stand Alone Edition running on more than one computer now includes a link to a blog article that explains how to solve the issue. Two new time punch formats added to Event Based Data Export formats, HHNNSS and HHNNSS AMPM. Reminding of new users about Employee PINs is now done with a properly styled form with a link to the explanatory video on our website. The first administrator login prompt is now done via a properly styled window. Whenever the software tries to access our website it correctly tries to access the HTTPS version of the website rather than the old non-secure address. Fixed a problem with the crosstab query when loading a group of time punches and there was more than one time note recorded against a single time punch. Fixed a problem with the display of status icons on the Edit Times screen and the Dept. Folders on Employee List setting was switched on. We’ve just posted a small update to our tool to export data to SQL Server or MySQL. The rather imaginatively named “Database Exporter” will now gracefully handle the case where NULL values have been inserted into numeric database columns. This can ONLY happen if you’ve added custom data columns to the Time Clock MTS database, as Time Clock MTS is well-mannered enough to make sure it actually inserts values into numeric columns rather than leaving them NULL or empty. The latest version of our Database Exporter tool can be downloaded from here. Note that this tool CAN ONLY BE RUN FROM A COMPUTER WITH TIME CLOCK MTS INSTALLED ON IT as it is dependent on libraries that are installed with our time clock software. Note also that it must be installed in the same folder that Time Clock MTS is. You’ll have to download and install the update on any computer that is using email alerts. It’s been a rough few weeks here for us due to a number of technical issues. The complete failure of our Windows 7 build machine kicked it all off. We decided to move to Windows 10 for our build process and that took a bit longer than expected. Throw in some issues that Windows 10 caused, a fairly significant problem with the installer for Time Clock MTS version 6.1.1 that raised issues with a number of users, a false positive virus scan on the program installation file, an obscure Windows XP bug, and dealing with time clock computers with broken Windows Fonts and you’ve got a set of circumstances that have tried us. Never the less, we’re sure we’ve seen all of that off and as a result we’ve come out the other side with a better, more reliable product. Two releases have happened in the last two weeks, versions 6.1.2 and 6.1.3. The changes should be invisible for most people, but I’ll detail them anyway. There were at least two users who (somehow) didn’t have the regular version of the Times New Roman font installed on their computer. The reporting system of Time Clock MTS is dependent on this being present, and given that it’s a default Windows font you can (usually) rely on it being present. The software was failing silently if the font was missing. This error is now caught and presented to the user. Fixing the missing font is as simple as finding the valid times.ttf file on another computer, copying it to the broken computer, and installing it. The first run process for the Time Clock MTS Client software was broken. It would allow users to connect to a shared time clock data file but reports could not be run and employees not punched in or out immediately after connecting to the data file. Restarting the software fixed the problem. Clearly this was not satisfactory and has now been resolved. One Windows XP user was getting a “Multiple-step OLE DB operation generated errors” error message whenever they started their software. According to this Microsoft Knowledge Base Article it’s due to a malformed or missing Windows registry entry. We followed one of the suggested resolutions in the article which was just a tiny change to the software, and the problem was resolved. Moving to a Windows 10 build process lead to us adopting the latest version of the Microsoft Active Data Objects library which is used for all of the database systems in Time Clock MTS. It turns out that this library is not compatible with Windows versions prior to Windows 7 Service Pack 1. As we are committed to supporting old versions of Windows for as long as possible we’ve now started using a backwards compatible version of the Active Data Objects library and the software now runs properly on Windows Vista and Windows XP. It’ll also work on Window 7 if you don’t have Service Pack 1 installed, but to be honest, if you’re using Windows 7 without Service Pack 1 you should strongly consider installing it. Version 6.1.1 included a brand new component that moved some old forms into a .NET library. This was part of our on-going future proofing development program for Time Clock MTS. Unfortunately we messed up how this component was included in the installer and as a result some users were getting strange application crashes and “file not found” errors. We’ve reviewed the installation processes now and identified where we went wrong and fixed up those issues. We had one report of the installer being identified as containing a virus by a user with Mcafee anti-virus on an Acer laptop. Obviously this was a false positive. We were unable to replicate the false positive with our install of Mcafee. We made some adjustments to the software build process and had the user re-test the new installer and it no longer is identified as containing a virus.